I put a feminist requirement in my OKCupid “message me if” so you don’t have to! Last night I cleaned out my closet where I shove everything I don’t know what to do with. I found approximately 8 toll bills (whoops), 20 Anthropologie catalogs, a broken Roku remote, about a thousand loose Ikea screws, and as many relics of past lives. Tickets to shows I went to with friends I haven’t seen in years; scripts, cards, and sundry props from projects that fell apart before they should have; three consecutive years of Valentines’ Day cards from three different guys. Every little saved memento left me more emotionally confused. I had folded each item for saving when it was still a happy memory – still something I was actively working on. Re-opening each of them reminded me of a time when I felt excited, and then, immediately, the time when I felt the excitement slip away. I bought a new Roku remote. The rest felt less replaceable. I think everyone tries hard to live without regrets, so as I stood, looking at a physical manifestation of everything I’d ever fucked up, I debated if there’s anything I could have done differently. I tried to find some level of compassion for past me, who didn’t know why her moods were cycling, who hadn’t learned to protect herself, and who let herself love when she knew it would end badly. I’d spent some time hours before talking with friends about the ways in which depression can touch your most important relationships. I’d been the cheerleader. “It won’t always be like this,” I’d said. And yet the more I dug through my closet, the more I held physical evidence that it always had. But every tenth item told a different story. I found a stack of mementos I’d forgotten to give back after I hastily moved out of a man’s apartment, and I felt proud of him for everything he’d accomplished. I folded them neatly and put them in the old birthday gift bag I keep the good things in. I found a bio for a friend I’d lost touch with, but since recovered. The cardstock slid satisfyingly into the gift bag. At the bottom of a stack, a dated letter from a friend on a day when I’d helped him through a personal crisis. In the bag. Eventually, the sting of loss felt less intense for every item. Photos from day trips with friends I’d since argued with. Relics from a Halloween that had ended in my embarrassing myself. They seemed funny now — positive, on the whole. How could this evening ever not end well? Determined not to hoard, I said goodbye to some memories as I tossed them in the trash, but I started to mentally thank everyone who I had ever loved, even if they weren’t around anymore. It’s hard to view love in its aggregate. It’s easy to fixate on it’s latest iteration — the one that was hard, or that hurt. Sometimes I feel like I look at the past through a dark screen, that my negative experiences color my memory of the positive ones. In the end, I felt like I wasn’t just cleaning out my closet; I was cleaning out a decade of mental gunk. 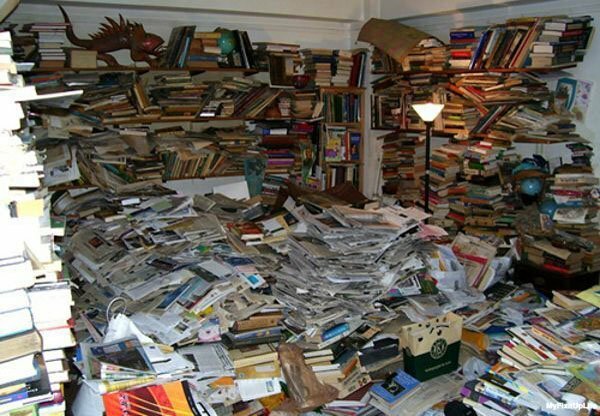 I guess what I’m saying is, become a hoarder! It really pays off in the end!